Griffith, Brig. Gen. Samuel B (USMC) (1974). "Part 96: Battle For the Solomons". History of the Second Wold War. Hicksville, NY, USA: BPC Publishing. Long, Gavin (1963). Volume VII – The Final Campaigns. Australia in the War of 1939–1945. Canberra: Australian War Memorial. สืบค้นเมื่อ 2006-11-02. McCarthy, Dudley (1959). Volume V – South–West Pacific Area – First Year: Kokoda to Wau. Australia in the War of 1939–1945. Canberra: Australian War Memorial. สืบค้นเมื่อ 2006-11-02. Morison, Samuel Eliot (1958). Breaking the Bismarcks Barrier, vol. 6 of History of United States Naval Operations in World War II. Castle Books. ISBN 0785813071. Odgers, George (1968). Volume II – Air War Against Japan, 1943–1945. Australia in the War of 1939–1945. Canberra: Australian War Memorial. สืบค้นเมื่อ 2006-11-02. Spector, Ronald H. (1985). Eagle Against the Sun. The MacMillan Wars of the United States. New York: MacMillan, Inc. ISBN 0 02 930360 5. Dyer, George Carroll. "The Amphibians Came to Conquer: The Story of Admiral Richmond Kelly Turner". United States Government Printing Office. สืบค้นเมื่อ October 20, 2006. Gillespie, Oliver A. (1952). "The Official History of New Zealand in the Second World War, 1939–1945; The Battle for the Solomons (Chapter 7)". New Zealand Electronic Text Center. สืบค้นเมื่อ July 11, 2006. Hoffman, Jon T. (1995). "FROM MAKIN TO BOUGAINVILLE: Marine Raiders in the Pacific War" (brochure). WORLD WAR II COMMEMORATIVE SERIES. Marine Corps Historical Center. สืบค้นเมื่อ 2006-08-29. Melson, Charles D. (1993). 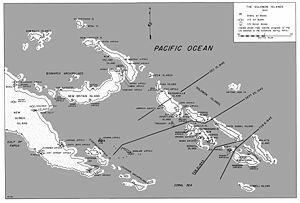 "UP THE SLOT: Marines in the Central Solomons". WORLD WAR II COMMEMORATIVE SERIES. History and Museums Division, Headquarters, U.S. Marine Corps. p. 36. สืบค้นเมื่อ September 26, 2006. Miller, John, Jr. (1959). "CARTWHEEL: The Reduction of Rabaul". United States Army in World War II: The War in the Pacific. Office of the Chief of Military History, U.S. Department of the Army. p. 418. สืบค้นเมื่อ October 20, 2006. Mersky, Peter B. (1993). "Time of the Aces: Marine Pilots in the Solomons, 1942-1944". Marines in World War II Commemorative Series. History and Museums Division, Headquarters, U.S. Marine Corps. สืบค้นเมื่อ October 20, 2006. Rentz, John (1952). "Marines in the Central Solomons". Historical Branch, Headquarters, U.S. Marine Corps. สืบค้นเมื่อ May 30, 2006. Japanese Operations in the Southwest Pacific Area, Volume II - Part I. Reports of General MacArthur. United States Army Center of Military History. 2004 . สืบค้นเมื่อ 2006-12-08. - Translation of the official record by the Japanese Demobilization Bureaux detailing the Imperial Japanese Army and Navy's participation in the Southwest Pacific area of the Pacific War. Hungerford, T.A.G.. (1952). The Ridge and the River. Sydney: Angus & Roberston. Republished by Penguin, 1992; ISBN 0-14-300174-4. หน้านี้แก้ไขล่าสุดเมื่อวันที่ 20 มกราคม 2561 เวลา 20:06 น.